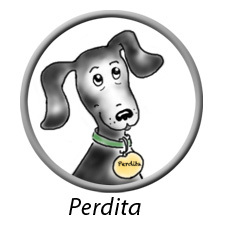 Perdita is proud that she creates her own improved version of English. All through the books you’ll find her unusual words–words she insists are better than the boring versions humans use. So, to get you started, here are a few of her favorites. Par is Perdita’s father. His full name is “Par Whack.” She says that Par “sounds better” that just plain “Pa.” Par, of course, is the ultimate Whack, and a VERY active dog. Thought-Particlesis what Perdita calls the way she transmits her thoughts directly into Laura’s brain. No one understands how she does it, but Perdita claims she keeps the power of these thought-particles low so Laura’s brain won’t explode. 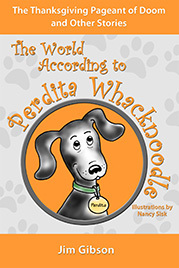 Whack is an exclusive dog family, according to Perdita. She calls the Whacks “more active dogs,” which seems to mean extremely over-active, wild, uncontrollable hyper dogs. Her famous father (who she calls “Par”) is a Whack. Noodle is an exclusive dog family that Perdita says is made up of “more thoug htful dogs.” This seems to mean that the Noodles are dogs who sleep all the time, are lazy, won’t run or play. We might call them “lazy,” but Perdita insists that they are deep thinkers and extremely wise dogs. Many of her stories are about the Noodles, and her mother (who she calls “Mar”) is a Noodle. 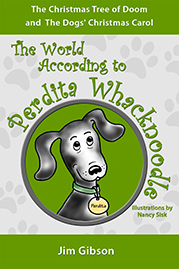 Smith is the family name of most dogs, dogs Perdita calls “regular dogs.” Since she thinks Whacks and Noodles are the most advanced dog families, Perdita talks about the Smiths the same way a member of the Royal Family would talk about a trash collector. 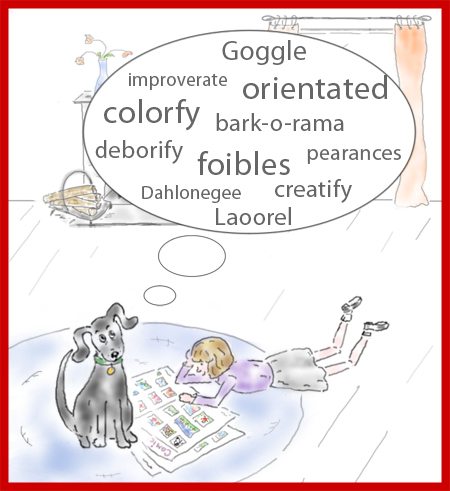 Working dogs are all Smiths, and Perdita points out that NO dogs in HER family work. Wild Giraffes, according to Perdita, are a big threat that are kept away by her heroic protection of the family. Perdita says these Wild Giraffes would break into your bedroom and carry you to the caves where they live. Laura thinks Perdita got this idea from The BFG, but Perdita denies it, and gives herself credit for keeping the family safe. Dahlonegee is what Perdita calls the small mountain town of Dahlonega, in North Georgia. She says she grew up on a farm near Dahlonegee, and studied at the college there. 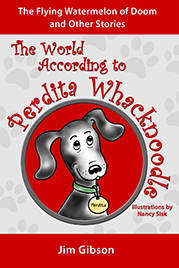 What are your favorites of Perdita’s made-up words? Do you make up words of your own? Why not? Perdita says your should “spectacularize” them.